In Episode 7 of the podcast, Nick and Wendy talked about their experience seeing gorillas in Virunga National Park in the Democratic Republic of the Congo (DRC). To accompany1 that episode, Nick has republished a blog post that he wrote at the time, describing the trip in more detail. 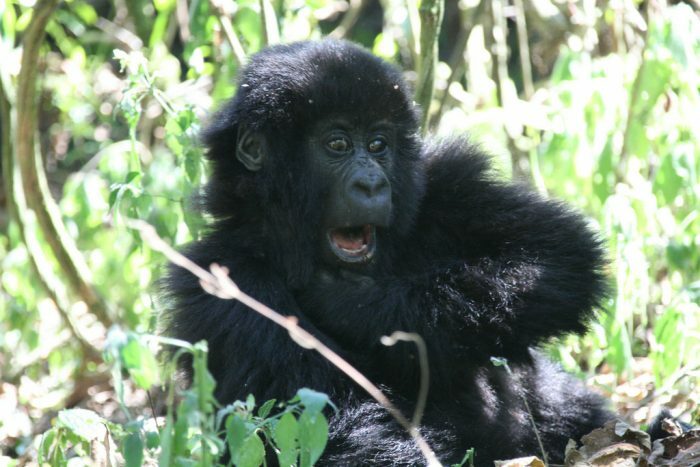 The reason we came to the DRC in the first place was that gorilla-tracking reservations in Rwanda and Uganda were already fully booked by the time we started planning the trip. Our last remaining option was the DRC’s Parc National des Virungas, the oldest national park on the continent and one so large that it adjoins2 at least six separate national parks in Rwanda and Uganda. 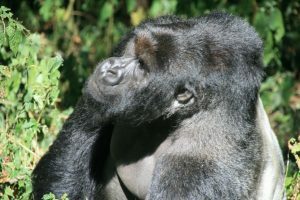 Unfortunately it’s not always safe, and the highest-profile example of how the turmoil3 in the country can affect gorilla-tracking was the 2007 execution of one of the four habituated gorilla families in the Bukima section of the park. Gorilla tracking in the DRC was subsequently suspended, but has since recommenced, so we made our booking and hoped that the current security situation would hold up. At US$400 per person, it’s $100 cheaper than in Rwanda or Uganda, but with an extra charge of $110 for a hire jeep and $35 each for the DRC visa, it pretty much turned out to be a wash4. On the morning of our reservation, we woke up at 5:10am and 20 minutes later we were in a 4WD heading towards the park, with an army jeep escorting us most of the way. The 40km ride from Goma to the park headquarters on an increasingly dreadful road took us about 2hrs 15min – to put this in perspective, a world-class marathon runner could have beaten us. In any case, it was fascinating to go past the villages along the way and see what the DRC is like outside the ‘haven’5 of Goma. The villages closest to Goma were the most prosperous6, with most houses built of wood with tin roofs, though even here there were signs of much hardship7. Some houses had no roofs at all and instead had UN tarpaulins for shelter, while the local women had to walk several kilometres to fetch8 water from the nearest pump well. Further on, the people were poorer and lived in shacks13 constructed only of bamboo and earth. It wasn’t the most poverty we’ve seen in Africa – the climate is conducive14 to successful farming, especially of banana trees, whereas in the semi-desert of the West African Sahel the people have absolutely nothing – but it wasn’t far off. Hundreds of kids in rags15 ran to our 4WD to smile and wave at us, and only as we got closer to the park headquarters did they start sticking out their hands hoping for money or sweets. We arrived at the park at about 8:15am and were delighted to find that we would be the only tourists tracking the Munaga group that day (there is a maximum of six tourists per family, and I think it’s quite rare even in the DRC to have the gorillas to yourselves). With an entourage16, of a guide, an armed guard and a machete-laden17 jungle hacker, we headed into the forest towards the slopes of one of the volcanoes of the Virungas chain in search of our gorillas. After 45 minutes we met the advanced tracking party, who had been sent out ahead of us to find the gorillas. Fifteen minutes later, a silverback was barging18 towards us, crashing through the jungle as he went and causing us to hurriedly back away – and after all these years of talking and dreaming about seeing mountain gorillas in the wild, here we were. 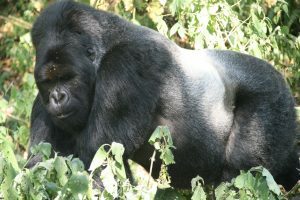 The Munaga family is apparently rather special as it consists of three silverbacks as well as two adult females and one baby of nine months. We watched them go about their daily lives – the adults climbed trees in a hugely destructive fashion while the cheeky baby did tumble turns19 on the ground and made funny facial expressions. They were much more active than I had expected and to see a silverback really charge is quite an extraordinary sight. Overall, the hour that we spent with these fascinating creatures (which is all you are allowed) was one of the great highlights of our travels, and worth every penny20.